New York, 1951. The new evolutionary synthesis had just gained a foothold, when Theodosius Dobzhansky published the second edition of his work Genetics and the Origin of Species. In it, there was a new, controversial concept stating that polymorphism in natural populations can be explained by overdominance, i.e. a fitness advantage of heterozygote individuals. 63 years later, I was on a hike in the beautiful Swiss Alps, when an individual of the chocolate-scented "black vanilla" orchid (Gymnadenia rhellicani) suddenly caught my eye. The flowers of this plant were not dark-red to black as usual, but rather of a creamy white colour. My curiosity was awakened, and I contacted a local orchid enthusiast, who told me about an enigmatic colour polymorphic population high up in the South Tyrolian Alps. Once back in the lab, my supervisor Philipp Schlüter was happy to support some further investigations. 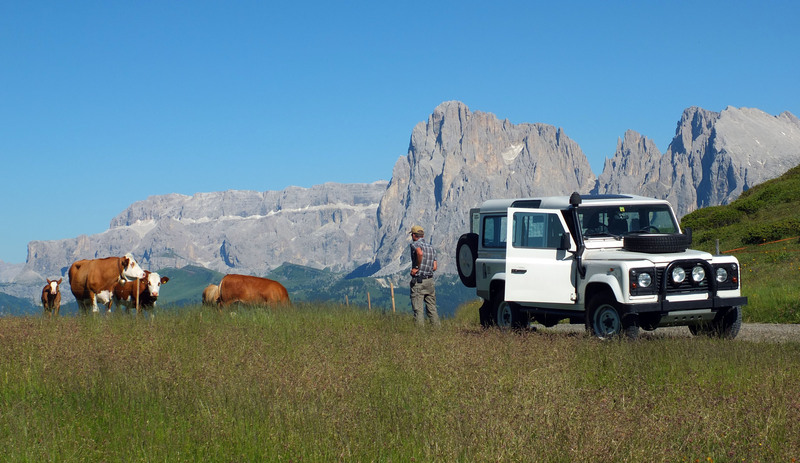 So we packed our stuff in my friend Mathias' Land Rover and, together with Kelsey Byers, a post doc at our department, headed off to Italy. Gymnadenia rhellicani plants with 'black', 'red', and 'white' inflorescences from the same population in the South Tyrolian Alps. Arriving at the population, it was clear that we were witnessing an evolutionary process in action: A sunny meadow was dotted with hundreds of black, red, and white G. rhellicani plants, and there were far too many non-black ‘mutant’ plants to be maintained in the population by chance. Also, census data collected by orchid enthusiasts over the last twenty years showed that both red and white plants were increasing in frequency. 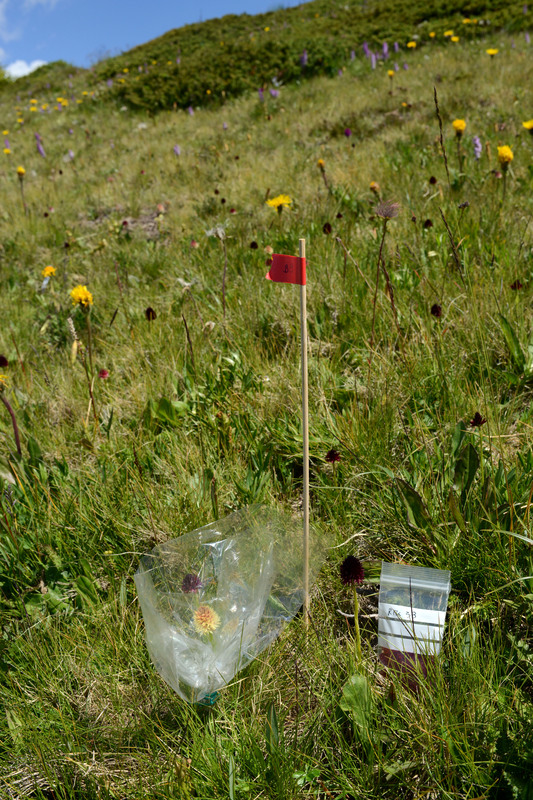 After realising that the local cows were attracted to our plant labels, Philipp had the clever idea to mark plants with RFID tags developed for studying the migration of fish, which allowed us to invisibly track an individual from flowering to seed production, when its green leaves are long gone. Cows about to eat our study system. Late at night, after endless counting of seed capsules and calculations on the backside of pizza boxes, we got a first, unexpected result: In contrast to our expectations, there was no indication of divergent selection; As predicted by Dobzhansky, plants of intermediate red colour had a significantly higher reproductive fitness than both black and white flowered plants. 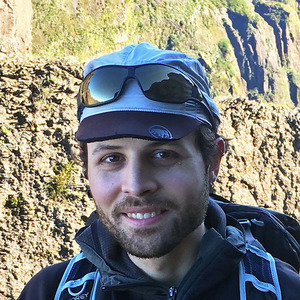 We knew that testing Dobzhansky's theory would require us not only to find both the selective agent and the genetic underpinnings of the polymorphism, but also to investigate whether the plants differ in any other trait besides coloration. This covers pretty much every type of analysis in evolutionary biology, so it was clear that we needed a lot of help: Rita Francisco and Amy LaFountain enabled analyses of flower pigments, Yannick Städler and Jürg Schönenberger produced 3D-scans of our flowers for morphometry, and Florian Schiestl helped us with gas chromatography analyses of flower scent. As for ourselves, we could finally be creative and use all our various equipment such as insect nets, time-lapse cameras, spectrometers, flow cytometers, sequencers, etc. 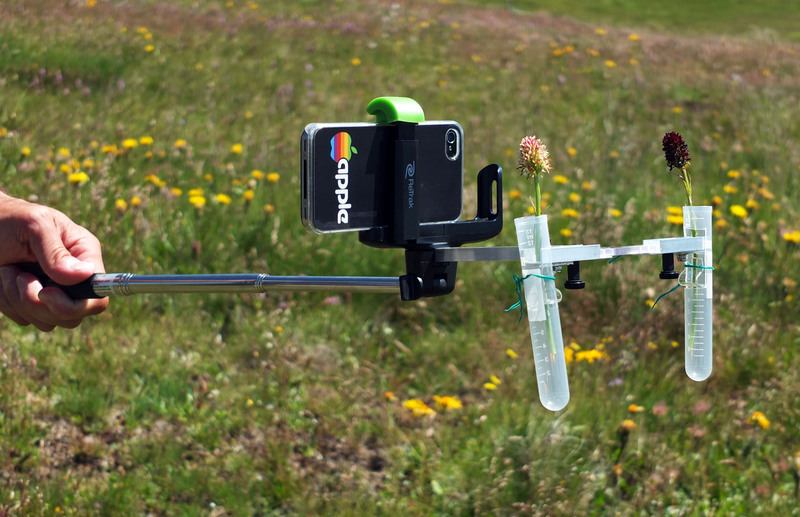 One of our many inventions, which unfortunately didn't make it into the paper: The floral interview selfie stick. Slowly, the pieces connected to a final picture, and with the discovery of the causative mutation we finally had to accept Dobzhansky's hypothesis. The flower colour polymorphism in G. rhellicani is caused by a single SNP in an R2R3-MYB transcription factor regulating flower pigmentation, most likely does not affect any other phenotypic trait, and is maintained by higher reproductive fitness in heterozygotes due to opposite colour preferences of bee and fly pollinators. A white G. rhellicani morph ready for floral scent collection. 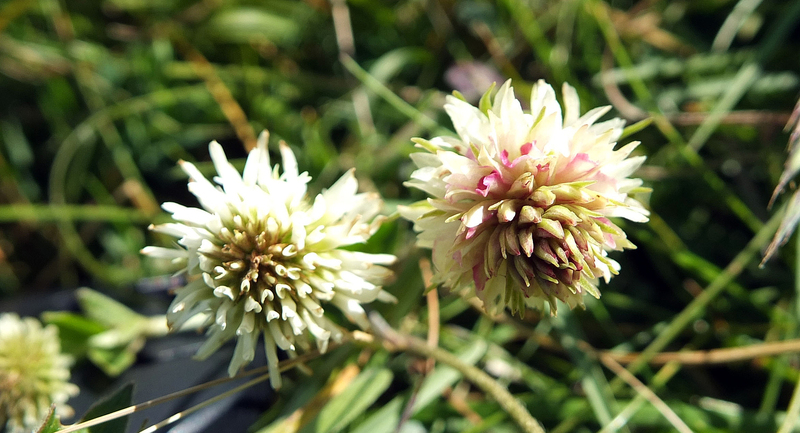 A white Gymnadenia rhellicani morph next to an inflorescence of the Alpine clover Trifolium alpinum. Apart from this interesting case of parallel evolution, we made another observation in this second population, which still needs further investigation: At this place, G. rhellicani is growing in sympatry with the common Alpine clover Trifolium montanum, and it is surprisingly difficult to visually tell it apart from the white G. rhellicani morph. All we know is that while there seems to be little overlap in floral scent profiles, both clover and orchid are visited by the same bee pollinators. What do you think? Would you buy our mimicry hypothesis?